Had a lovely bank holiday monday. The weather wasn't great but at least it was dry. 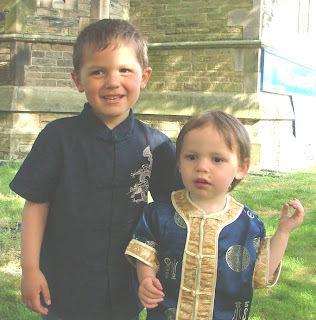 It was Carnival day in Welshpool, and Luke's classmate was pageboy on one of the floats. Been making jewellery today too. My sister Helen is going to a wedding on Saturday and comissioned me to make a pair of earrings and a bracelet. The brief was to be black and white and the earrings had to be long. 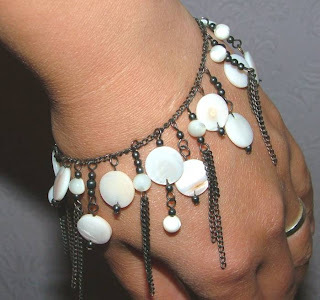 Ingredients: black chain and black metal beads, Mother of Pearl coin beads and Mother of Pearl round beads. Well... Ethan has! bless him. Still can't quite believe it, Luke is older and hasn't had it yet. The baby is due in less than three weeks, so hoping Luke gets it soon so hopefully contagion period will be over before he/she arrives! Good news... went for scan today to check baby's postition, as midwife and I thought it may have been breach... all is well, it's the right way up and facing in the right direction. Also the lady who did the scan measured the amount of water and said she didn't think there would be enough space for baby to move now, so all should be fine for homebirth no 3!!! Had to take this pick of Ethan, I got the clippers on his hair on Sunday afternoon, he's looks like a different child! 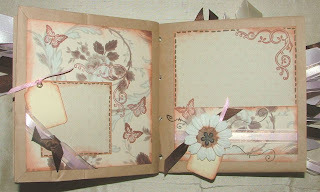 Ingredients: PP by Anna Griffin and unknown, stamps by Heidi Swapp and Rhonna Farrer, silk flower, duck button and crystal. DCM - Starting from scratch! Ingredients: PP by HOTP, TLC and unknown. hand cutting and doodling and sticky foam pads for 3D effects! Thanks DCM for this sketch! 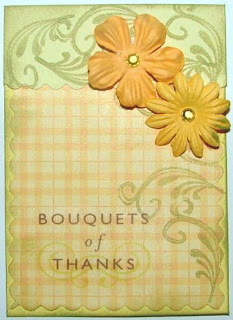 Just what I needed for a Thank you card. 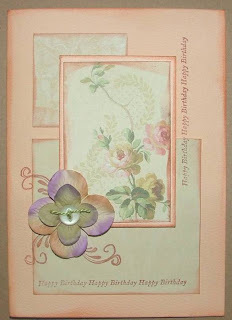 Ingredients: PP by HOTP and TLC, flowers by Prima, fower punch by Carl craft, stamps by Anna Griffin, Clevercut and Rhonna Farrer. 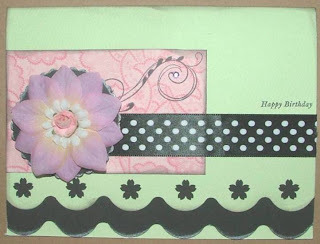 If you don't have any pink card blanks, you can easily make your own. 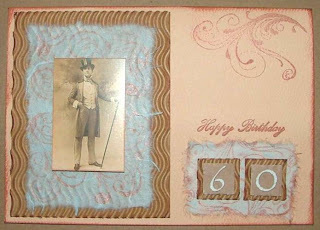 I didn't quite follow it strictly, as I've used a cream card blank... however, I'll probably do another one as its one of my fave colour combos! 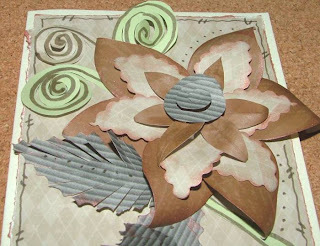 Ingredients: PP by Anna Griffin, Fiskars scallop scissors - large and small. 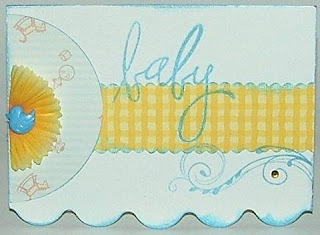 Fiskars shape cutter with circle template, Rhonna Farrer Stamp, Prima flowers, polka and gingham ribbon and flower gems from Goodwear. I've been enouraging my friend Carolina to design and sell Etsy banners as I think she's a talented graphic designer. Do check out her shop... 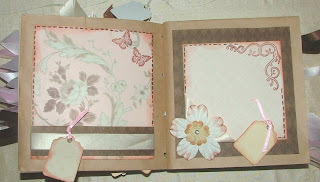 I'm sure she could design blog headers too!!! HEr style is really fresh, clean and modern. Got sent the sketches early from Di, managed to make 3 from a couple of them, it was really fun! To be honest I've used them as card toppers, but they were a great spring board. 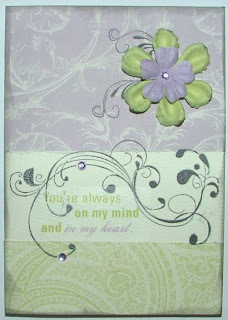 #7 - PP by HOTP, Rhonna Farrer swirl stamps, Brenda Walton sentiment stickers, crystal by Goodwear and Fiskars scallop scissors. Had a spare few minutes this afernoon and made this for the midweek DCM dare. I used a download from Kirsty Wiseman's blog and printed off the papers. 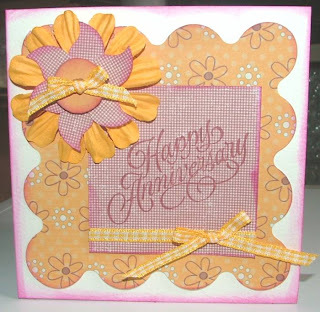 Ingredients: PP and button by Kirsty Wiseman, flower by Prima, leaf punch by Xcut Fiskars scallop scissors, stamp by Rubber Stampede and gingham ribbon. 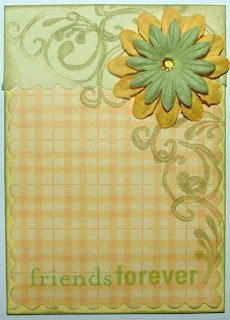 Ingredients: Anna Grifin and Rhonna Farrer stamps, number paper from HOTP, vintage repro photo. 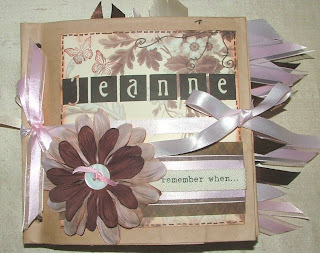 Ingredients: PP by Anna Griffin, scallop scissors by Fiskars, flower punch by Carla Craft, stamps by Rhonna Farrer and Do-crafts, flowers from local sources. 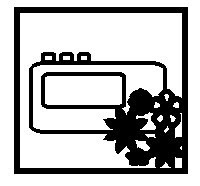 Useful sketch from CPS for a commissioned card for my friend's mum - I have just realised I didn't use my new "mum" stamp! I have however used my new hydrangea Primas! 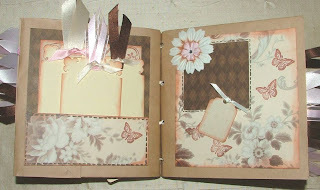 Ingredients: PP by Anna Grifin and TLC, flowers by Prima, stamps by Rhonna Farrer and Do-crafts. I knew that would get you looking!!! 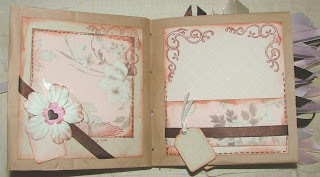 If you got to Craftybids forum, they are running a scrapbook layout/atc/card competition based on a sketch my sister did (clever girl). The prize is a Basic Grey Collection pack, you have just under two weeks! 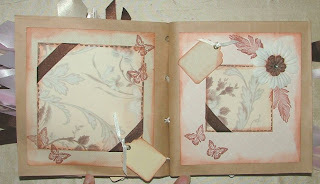 New stash and Di Hickman/Wednesday stamper challenge. Got some goodies in the post today, thanks to a Craft Obsessions birthday voucher and money! 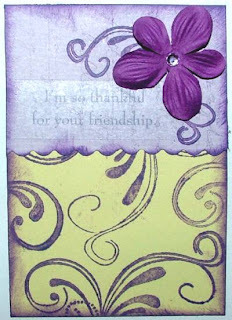 Some lovely Primas and those gorgeous new swirly stamps from Rhonna Farrer. 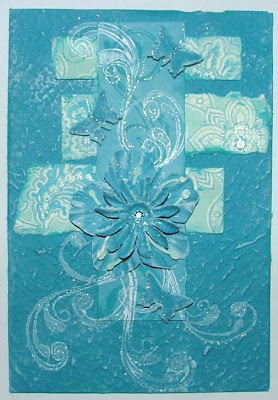 Have had a quick play using latest of Di's card sketches and Wednesday Stampers inspiration of Turquoise. 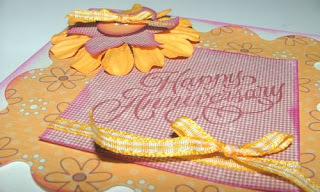 I am just loving the glitter pens by Sakura, they just add a hint of sparkle to anything they touch! 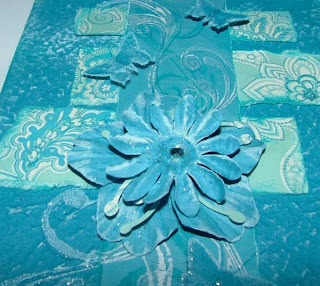 Ingredients: Anna Griffin and TLC PP, Handmade paper blank card, Primas, Butterfly punch, L-em stamen punch, Rhonna Farrer swirl stamps, a diamante and doodling with glitter pens. Been trying to make some more cards to go on sale at the craft unit at Lake Vyrnwy, they're having a special launch tomorrow, so would like to take the opportunity to put some more bits up there. Apparantly they've sold a few more cards of mine, I'm curious to know what has sold. 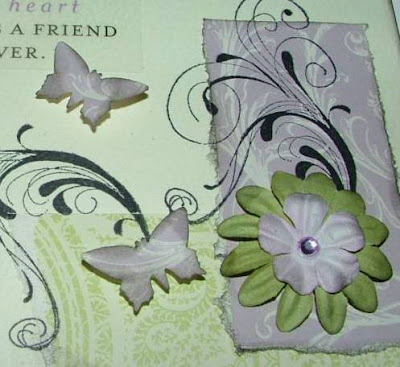 Enjoyed using up some scraps and my new stamps and flowers! 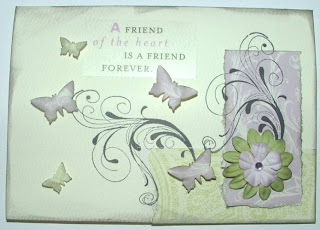 Ingredients: Anna Griffin PP, RF stamps, Primas, diamantes, Butterfly punch and Brenda Walton sentiment sticker. 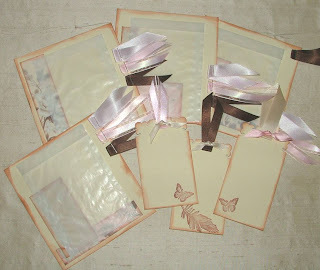 Some cards for DCM & Inkstains...and pressies! 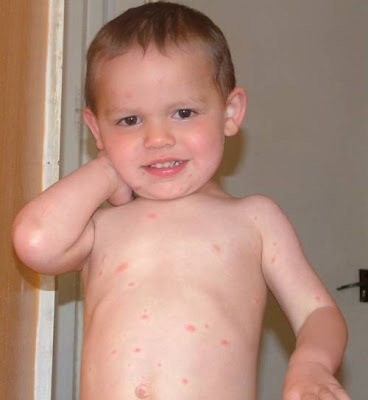 We've just had one of my dear uni friends, her husband and children stay the night. 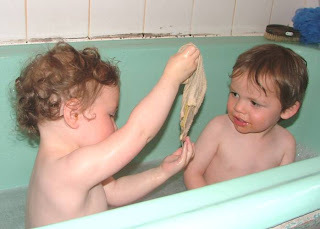 They have two girls who get on very well with my two boys. 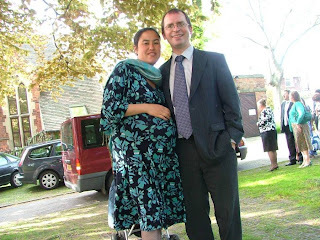 There was lots of kissing, giggling and screaming going on, and I think we also had announcements of marriage! Got this lovely cookery book from them... it's one I've had my eye on too! Can't wait to try some recipes from it. Recieved my RAK from Caardvarks this week too, some fabby gelly roll pens and glittery pens - justgreat for doodling and adding detail, thank you ladies! Also got some cards made! The Inkstains weekly challenge is wings, and as I was a bit late for the DCM one I thought I'd have a go. I love the Dragonfly punch from Xcut, its so delicate and as realistic as a punch shape can get. 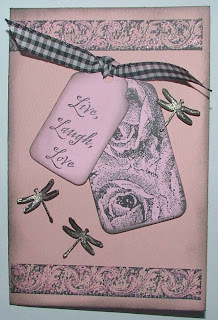 Ingredients: Anna Griffin and Rubber Stampede stamps, Xcut dragonfly punch, glittery pen and ribbon. Slight bit of cheating, had to use 2 bits of metal as I had to use a brad to hold the metal anchor. 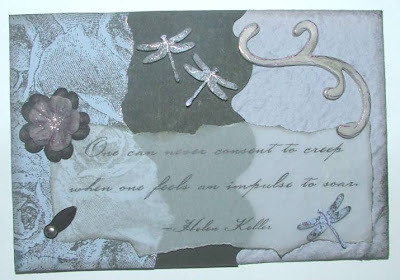 Ingredients: Rubber Stampede stamp, Xcut dragonfly punch DCM vellum quote, Prima flowers, TLC scroll chip, Fiskars scallop scissors and glitter pen. Lovely weekend... friends, weddings and pressies! 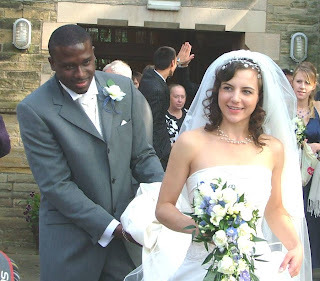 We were in Sheffield for the weekend with some lovely friends, and also attended a lovely wedding in York on Saturday. I had a belated birthday pressie from my friend, and I am so chuffed!!! 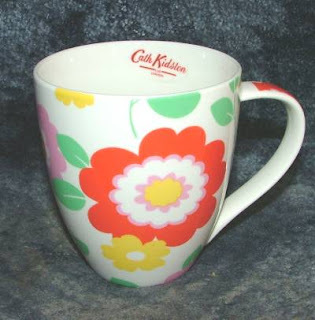 I have never owned anything by Cath Kidston, so look what I got! Tea is just going to taste so much better! The boys also got some new outfits, as the same friend had been to Hong Kong recently and bought these back for them. And the bride and groom...do you recognise the tiara? I am on a winning streak! 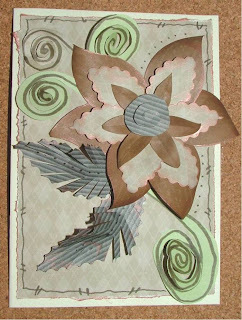 Found out this morning I won the draw on Paper Squares for the circle sketch challenge. I am so chuffed! Also my sister Esther won too! Made some very nice carrot and cinnamon cake today, from James Martin's recipie book. It was very simple to make, and the boys love it! Yogurt lolly making season has started! With all the lovely weather we've been having it's nice to give the children something cold when Luke gets home from school. I got the idea from Martha Stewart last year, and they were a real hit. She has a similar recipie here. 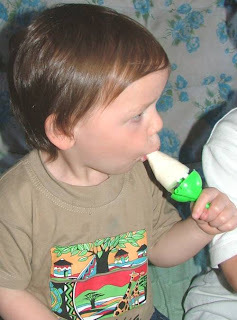 Just get some yummy natural yogurt with fruit in, squeeze some lemon juice in, mix, then pop in your lolly molds. If you'd like to be a bit more fancy, use different fruit yogurts and dollop alternate spoonfools into the molds for a stripey effect. Or wizz up some strawberries and layer this with the yogurt too...the options are endless! and addictive! - but a healthier option! I am always interested to discover new ways people use their creative talents. Today I discovered skin creating! 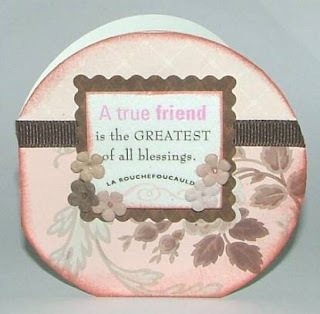 As in background images to download onto your mobile phone to personalise them. Came a cross a website that was free to join where you can upload your own designs so that they can be downloaded onto your phone, and can be made available to others too! I used a picture of one of my a topper I made a long while ago and some text. i've realised that the background is too light for my phone as the font colour on my phone is white...been trying to change it but can't figure out how, I'm off to look at the manual! Black, white and a colour - Ink stains. 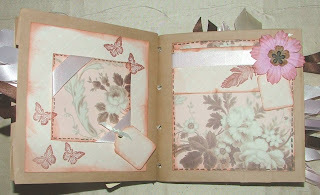 Ingredients: Ink distressed with Brilliance pad, Anna Griffin and Anita's stamp, prima flowers, vintage button and gingham ribbon. 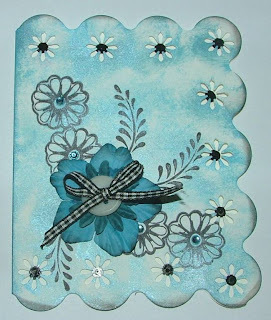 Fiskars large scallop scissors and a daisy punch, then hand doodled dots in the centre on the card underneath and some crystlas in the centres of the stamped flowers. Finished it at last, do you ever find it hard to know when to stop!? I kept doodling! Also, now you can see where my recent scraps have come from! 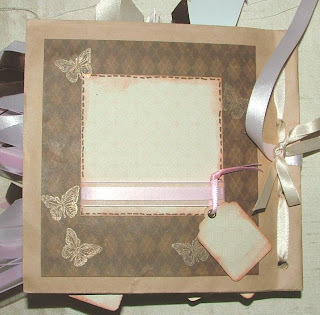 This is a commission for a hen present, the lady's friends will fill the album with pics of her throughout her life, so I've put blank tags for captions and glassine envelopes on the pullouts for extra photos. Ingredients: PP by Anna Griffin and TLC, flowers by Prima and Blooms to Go, lettering by Quickutz, twill sentiment by MM (I think), brads from Readicut (I think), butterfly stamp by All Night Media, Feather stamp by Rubber Stampede, Corner stamp by unknown, corner punch by Xcut, glassine envelopes, ribbon, vintage button and hand doodling. I deliberately cut the card so that it could stand up easier, as I found my first card rolled slightly. 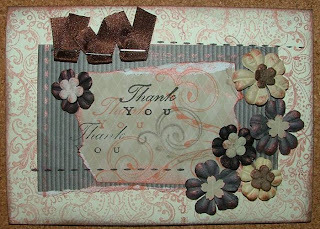 Ingredients: PP by Anna Griffin and TLC, Brenda Walton sentiment, Grossgrain ribbon, Prima flowers, Fiskars scallop scissors and shape cutter for circle.